Being sick and out of office today, I was still planning on reading my company email. However, it turned out that I was unable to sign in to my Office 365 account due to some “verification error”. The dark side clouds everything. Impossible to read your email is. 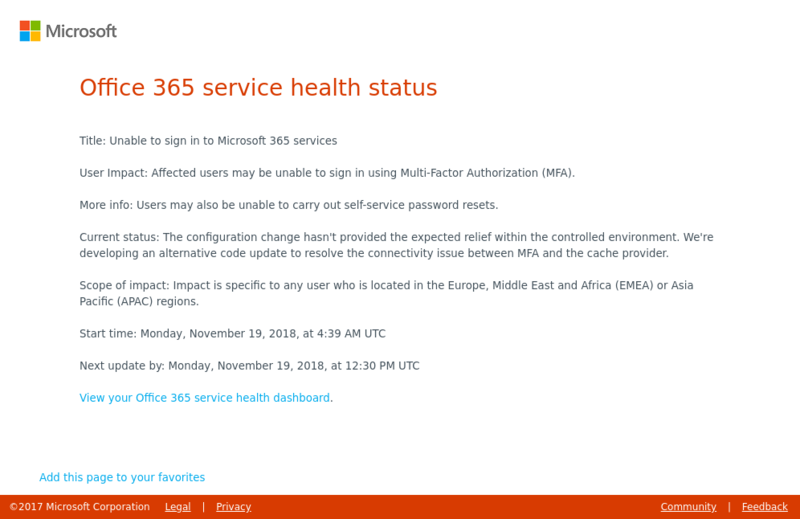 A few failed attempts later, I eventually managed to locate the “Office 365 service health” page (shown above). It confirmed that users may be unable to sign in using Multi-Factor Authorization (MFA) from Europe, Middle East, Africa and Asia. The configuration change hasn’t provided the expected relief within the controlled environment. We’re developing an alternative code update to resolve the connectivity issue between MFA and the cache provider. Translation: We currently have no idea why this is happening. An initial reboot did not resolve our issues. Why on earth would there ever be a need to write such an article one might ask? Well, the current Outlook Office 365 version had me puzzled as I was unable to manually configure an IMAP account according to my preferences. Apparently, "set up your account manually" now translates to let Outlook autoconfigure the account. I recently learned that it's possible to use Google Authenticator (or any other authenticator app) with Office 365 for 2-step verification. That's great as I've always believed it was Microsoft Authenticator or the highway. I'm sure Microsoft Authenticator works fine, but I don't want multiple authenticator apps on my phone. What is the latest Skype for Business User-Agent string? When using a client other than Skype for Business (formerly known as Lync) to connect with your Office 365 account, you'll need to provide the Microsoft Lync servers with a user-agent string they recognize as an "acceptable" client. The reasoning behind this is surely to give you the best possible experience and not at all to lock out other messaging clients.